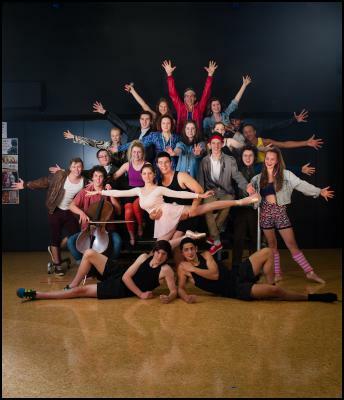 Home > Current Buzz > 90 young dancers, singers, actors and musicians from Scots College and Queen Margaret College, in a joint production of Fame! On Wednesday 25 July, the curtains will be lifted on a cast of 90 young dancers, singers, actors and musicians from Scots College and Queen Margaret College, in a joint production of Fame!, based on the iconic and much-loved 1980s movie and TV programme of the same name. The show runs from 25-28 July, and is the first production to be staged in Scots College’s brand new Creative and Performing Arts Centre - a fitting showcase of both the talented young men and women on stage, the crew backstage, and what this stunning new facility is capable of. “Fame! is the story of a group of students at a Performing Arts High School and follows their successes and set-backs as they navigate through life and launch their careers,” said Learning Area Co-ordinator of the Arts at Scots College, Claire Hall. “It seemed fitting, as many of our students also aspire to take their creative passions and abilities to the next level. This show gives these students an opportunity to shine, and also provides a great experience for others who are happy to be part of the fun of a production, singing and dancing in the chorus,” said Hall. “Some of the ‘fresh young talent’ to watch out for in the show includes Scots College Tenor Gareth Barker who has just returned from recording an album in New York and is set to appear in the upcoming TV series, NZ’s Got Talent,” said Director of Music, Andrew Stopps. “And Violinist Andrew Kelly, one of the youngest members of the elite New Zealand Youth Orchestra, will also be performing in the show alongside talented singer and pianist Taru Naug,” confirmed Stopps. “Equally, actors Tim Brown, James Costello Ladanyi and Bronwyn Ensor from Queen Margaret College are naturals on the stage, and Peter McKenzie and Amarind Eng are fantastic slapstick comics. I look forward to watching where their future studies and careers may lead them,” reflected Hall. “We also have a large number of ‘all-round men’ in the cast which is great – boys such as Jackson Garden-Bachop, TJ Va’a and Mario Cooper who are juggling high level representative rugby with singing, dancing and acting in the show,” said Hall. “Everyone’s welcome, and I encourage members of the public, of all ages, to come along and enjoy the show,” said Headmaster of Scots College Graeme Yule. “There’s something very exhilarating about watching young people showcase their talents, having fun and at the same time wondering whether you’re watching ‘the next big thing’” he said. The Creative and Performing Arts Centre at Scots College is a state-of-the-art building that has been designed by award-winning Athfield Architects, and includes three floors of purpose-built creative teaching, rehearsal and performance spaces. “Each classroom, studio and practice area is equipped with the latest cutting-edge interactive and sound technology. There are computer pods for graphics and robotics, seven acoustically designed music practice rooms, a designated rehearsal studio and performance theatre, and we are currently installing a full-spec recording studio and facilities for film and animation production,” confirmed Headmaster Graeme Yule. “This building is utilised by our students and staff during school hours, however from the outset it has been designed as an asset for the whole community. We have plans to launch our Creative Night School to the later next year, with local and visiting experts coming in to lead courses and give lectures on a whole myriad of subjects and specialist areas. Equally, the facilities are available for hire by individuals and community groups as well,“ confirmed Yule. “It’s hard to even imagine what our students, and members of the community will produce in this building in future, as half of it hasn’t even been thought of yet. It has been an enormous challenge for our College community to build this facility, and has involved a massive amount of hard work, tireless fundraising and support from both individuals and groups, for which we are incredibly grateful,” said Yule. Scots College is an Independent Presbyterian Day and Boarding Boys’ School; Years 1-13.